Vascular anomalies or malformations are a relatively common type of birthmark and Dr. Nicholas Bastidas has a depth of experience in treating them. Treatments vary based upon the type of vascular anomaly present and Dr. Bastidas is able to diagnose and successfully treat for whatever type of vascular anomaly your baby has. When your baby is born with a vascular anomaly, you want to select the best pediatric plastic surgeon to perform this surgery. Dr. Bastidas is renowned for his successful treatment of a full range of pediatric vascular anomalies and you can trust that your baby or child will receive the careful, excellent care you want for him or her. Dr. Bastidas is the team leader for the Cohen Childrens Vascular Anomaly program and works with a team of experts from Dermatology, Medical Oncology, Radiology, ENT and Interventional Radiology. Hemangioma are common vascular “tumor” or cluster of cells (non-cancerous). 30% of hemangiomas are present at birth. The other 70% of hemangiomas will become obvious during the next one to four weeks. Hemangioma is present in five times as many females than in males. While most hemangiomas will fade away when a child is 5-7 years old, many hemangiomas require surgical excision to improve the contour of the affected area. Surgery is the preferred treatment when a hemangioma is subject to bleeding, causes pain, is unsightly or causes deformation of surrounding anatomical structure. 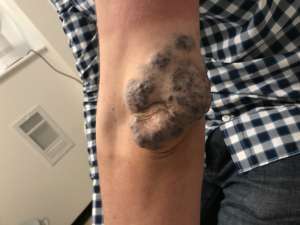 When a complex hemangioma is located in an area where surgery is not recommended, the vascular anomaly hemangioma can be treated with propranolol. This treatment requires outpatient monitoring and a baseline EKG. Vascular anomalies can involve arteries, veins, lymphatic vessels and capillaries. The most common vascular malformation is Port Wine Stain, a condition present in three of every 1,000 births. This vascular anomaly is a capillary malformation and often covers a large portion of the face. Port Wine Stain often responds most effectively to laser surgery, but on occasion requires a series of surgical treatments. Laser surgery is performed effectively with little risk of scarring or damaging your baby's skin. Studies are showing that this treatment is most likely to be successful when surgical treatment is performed on infants and children at an early age. Dr. Bastidas has pulsed dye light and Yag laser in his office that he uses to efffectively treat port wine stain. Dr. Bastidas and his team will meet with you at your earliest convenience and help you to understand your child's vascular anomaly and its remedy. Venous and Arteriovenous vascular anomalies: These vascular anomalies are made up of abnormally enlarged veins. They will grow over time, causing pain and swelling, with a chance of clots forming and calcifying. Dr. Bastidas performs several techniques to deal with these vascular anomalies including medications and surgery. Lymphatic formations: This form of vascular anomaly is a mass in the head or neck resulting from an abnormal formation of lymphatic vessels and are often effectively treated with sclerotherapy injections, often eliminating the need for surgery. Dr. Bastidas treats both pediatric and adult patients with vascular anomalies and his team of professionals are available to discuss the best treatment approaches available at your convenience. The treatment of vascular anomalies is performed on patients of all ages and Dr. Bastidas' depth of experience is widely recognized. While vascular anomalies are complex and treatment is essential, you will find Dr. Nicholas Bastidas to be qualified, compassionate and committed to delivering safe, excellent quality healthcare to his patients, assisting you to comfortably navigate this medical procedure. Visit our websites at www.hemangioma.com and www.ippcs.org for more information on vascular anomalies and the plastic surgery practice of Dr. Nicholas Bastidas.